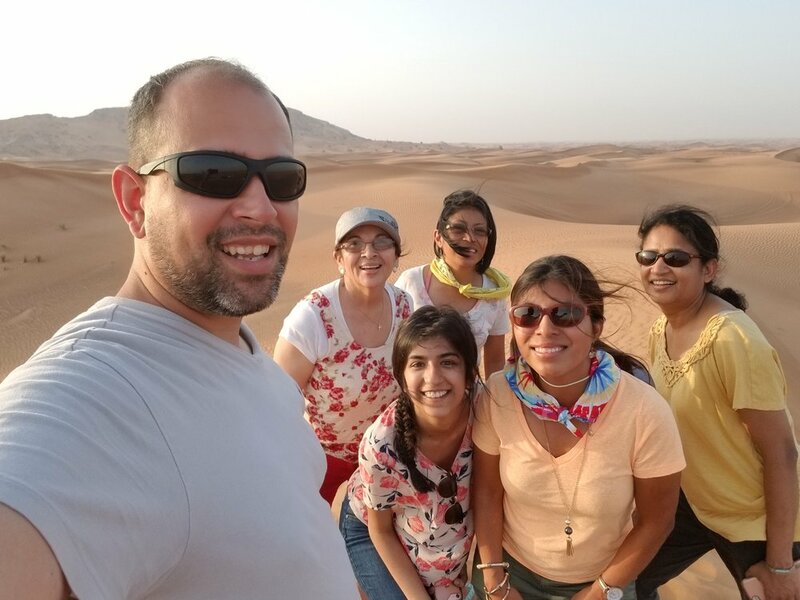 My name is Bartola Kuruvilla, and I am the Children's Minister at the Journey Church and I have decided to share with you a couple of blogs about my experience to the Middle East, specifically Dubai, and India. This is my first time to these places and will be speaking through those eyes. Here we go, TJ (my husband) and I have been planning for this trip for about 2 years. I am very grateful with my in-laws and their daughters who agreed to take us along with them (they know the culture and speak the language). Also, my sister, her husband and my mother are tagging along. This should be fun!!! I can't begin to tell you how excited I am about this Journey. 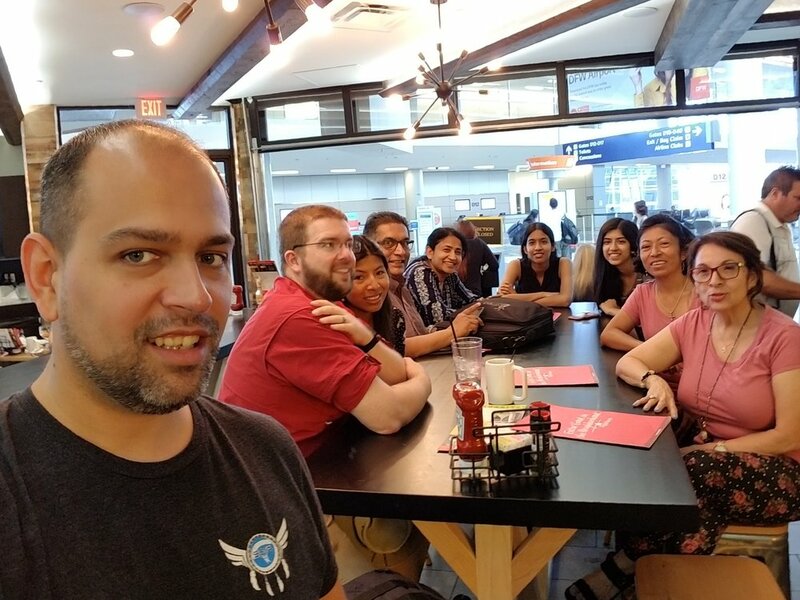 This is a unique and special trip not only because this is my first time to these places (and with immediate family) but also, because I will have the opportunity to meet TJ’s Ammachi (grandma) and uncle and family. My only hope is that by the end of the trip we have grown as a family and still love each other, more than before. I am grateful to God for this privilege to travel the world and see different aspects of his creation. I am ready to take on this adventure!! We are making a 3 day stop in Dubai on our way to India. For sure, I will have a lot more to say about India since we are staying there longer. We depart from Dallas to Dubai and the flight is 15 hours. What? My original thought, What am I going to do with so much time to spare? But, truly speaking, it didn't feel bad at all. I got to watch 2 Bollywood movies. The first one was called “Patel Ki Punjabi Shaadi” and the other one was called “Toilet”. I can't really recall what they were about, considering they are known to be long. I was amazed to see how big planes can be. The emirates Airlines had me in awe for quite some time. The one we traveled in consisted of 2 rows of three seats on each side divided by one row of 4 seats in the middle, I have never seen one this big before. For dinner, I had a choice to pick between Chicken & Herb Ragout, And Palak Paneer, I had Palak P. It was incredibly delicious. This was the beginning of what it would be like for the next 3 weeks foodwise. The appetizer was Conchiglie Salad and dessert was Fruit of the Forest Crumble. For breakfast we had fresh fruit and the main dishes were, Scrambled Eggs with Chives or the option of Medu Vada, (lentil fritters served with Upma and Vegetable Sambar) that's what I had. In between meals we had Emirates Pizza. When it came to rest; I can't really say if I did or not. But, what I can tell you is that, The Jet Lag created a feeling that I can’t really describe. My whole body together could not function, and I could not think right. I was not prepared for it, that’s for sure. Not to mention, I got the travelers tummy bug, (that’s what I’m calling the “D” word) the second day in Dubai. I thought to myself, this is too early to be getting all of these achaques, as we would say in Spanish. Past that, the flavors of Dubai are exquisite. I had the opportunity to try fresh dates. They are yellow in color, sweet and crunchy. For some reason I thought dates were a type of banana. So, in Honduras, we have a tiny, very sweet kind of banana which we call, Datiles, and in my mind, somehow, Datiles were dried fruit that eventually they were called Dates. Sadly, I’m not the only Honduran who thinks that. Oh well! I might have had a little too many of them causing my tummy the “D”. The quantity and variety of dates in Dubai is impressive. Please see pictures below to get an idea, because a picture speaks louder than words. One of the things that I will keep an eye for is to find some kind of snack with gold flakes. That was one of my friend's request to bring back, lol! I for sure saw ATM machines to purchase blocks of gold, but surely my sweet friend wouldn't want that much. Before I go any further let me tell you that shopping in Dubai under extreme heat is an unforgettable experience. It was so so hot and humid, that when I took my glasses and cameras out it would immediately fog. And I felt like I had just entered the sauna room. One place where we did most of our walk was at the Gold Souk, this is a shopping market along the streets, of course, this is like an outdoor gold mall. Gold, gold, gold everywhere you turned your head to. As TJ and I walked along the streets, we noticed guys randomly standing or leaning towards the store walls and suddenly they would approach us, and would start walking beside us, it felt weird having a stranger join us as we shopped and talked. They would offer us products and we would say no thanks, which was more like saying yes. For the first couple of times reluctantly we agreed. The interesting part about this is that the stores they took us to felt like we were going through a labyrinth, then, an upstairs. This is a good strategy, otherwise people would not know of the stores hidden in the back and on top. This only worked for the first 3-4 times with us, after that we decided not to make eye contact, otherwise we would spent all of our time following people. Not that I knew what they were saying but, you can only conclude. One cool thing I saw as I walked, was a Burj Khalifa tower made out of 50 lbs. of gold!! Crazy!! Here are a few more Souks that need to be mentioned, Perfume Souk, a Spice Souk, and a Textile Souk, Dates Souk (I made that up), once you see the pictures you will understand. Since I can't talk about every detail I am going to make a list of sightseeing we did while in the majestic city of Dubai. We drove through an underwater tunnel to take a closer look of the Atlantis Hotel at the other side of Palm Jumeirah. Walked the sands of the Arabian Sea to take pics of the Burj Al Arab Hotel, the boat shaped hotel. Visited the Dubai Mall and Mall of the Emirates, watched the Dancing Fountains, from that same spot we took a better look at the Burj Khalifa building, famous for being the tallest building in the world with height to tip being 150m.and is light synchronized with the Dancing Fountains when on. This was incredible. We took a tour of the Dubai Museum, rode a boat on the Dubai Creek which took us under a floating bridge, and was able to appreciate the surrounding buildings while broiling like shrimp, as it was currently 105 degrees feeling like 117 degrees. For the first 3-5 minutes after stepping foot outside my body would go from chills to hot, to stickiness to pouring sweat. I believe Dubai was the place where I had the most expensive 5-ounce ice cream ($8), water, coconut water and anything else that would quench the thirst. Its not like we didn’t carry our water, we just go through them so fast. One of the last places we ate at before leaving Dubai was at the Lebanese Village Restaurant. The people are so kind and sweet and willing to put up with a demanding group. We ask to be seated where is colder, and they took us to the second floor which was hotter. They had these fans blowing upstairs and downstairs and I don’t think the upstairs air conditioning was working. So, we came back down and seated in front of the fans, which was cooler. And as is natural we had many questions about the menu. Poor guys!! Among the other sightseeing we did, we went to the base of the Dubai Frame, the world’s largest picture frame, we walked away from it to try to get a picture with all of it in it. And last, but not least, we went on a Safari Ride. To get to where the camels were, we rode jeeps for which the tires are deflated for better traction. No one told me these jeeps were going to get crazy. Our group was divided in 2 cars. The mild ride and the wild ride. I figured it can't be that bad, so decided to go in the wild one. Of course, we are not the only ones. There are tons of jeeps going all directions, and as soon as I saw the ones ahead of us, I thought to myself, we surely won't be doing that. Little did I know! I had just made a bad mistake of choosing the wild ride. I didn't throw up or anything but as soon as the Land Cruiser started jumping I was honored to use my vocal cords to the highest pitch. If you know what I mean. I am loud enough without being scared, but this one was out of control. I think I scared some people, because they didn't know if I was for real or being silly. And my family thought that was so funny, Amanda(my mother) started recording videos of my panicky moment and my brother in law, started taking pictures. Anyways, both cars stopped, and I switched to the mild one. Still somewhat terrified but better. We finally arrive to where we were headed to and had a blast. We decided to have a henna tattoo done, enjoy the dancing shows, and have a delicious meal and rode camels. There are lots of camps established all over the place and each camp hosts, maybe over 300 people in the evening shifts. The camp we visited was Royal Eagle, they are professional and friendly people. So, as far as now, there have been no major incidents and we, the crew have had a blast. So grateful with my in-laws Thomas and Josephine for planning this sightseeing for us. First impression counts, I was impressed! What a FANCY place this is.